I have been a very naughty House Lady. Of the 45898934 hummingbird photos and the 7989895 photos of finches, cardinals, bluejays, cowbirds, starlings, woodpeckers, crows, terns, skimmers, seagulls, herons and one or two hawks, there has been one feathered friend I have neglected. Today, Mr. Jack Sparrow so kindly pointed that out. I had no excuses. I made none. But I could atone for my oversight, he chirped, with a whole post, featuring his family. (shhhh.......they don't know this, but he really isn't their brother. egg in Mrs. Sparrow's nest while she was out! But Calhoun Cowbird has been a good brother, even if a bit rowdy. Today he tried to encourage them to take a dip. But John, Johnny and Joanne were a bit skeptical. 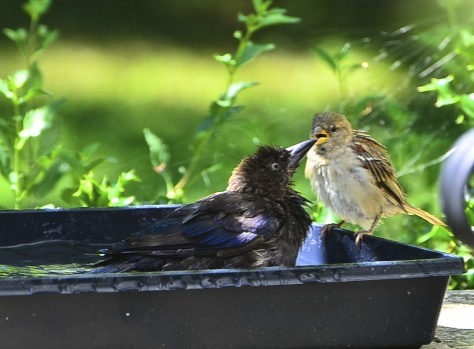 So, Calhoun Cowbird tried again to illustrate the ways of bathing. So .... this was my day today. Making amends. It could be worse. The yellow jackets could have been demanding equal time. "madder than a hornet's nest"
Fortunately, they've been too busy on the hummer's feeder to notice. Go ahead, John, Johnny & Joanne, take a Depp! I mean, DIP! ha ha! You have the most darling posts! I love the stories with your great images. :) Just darling. ...and, TexWisGirl, that's a good one! Ha! 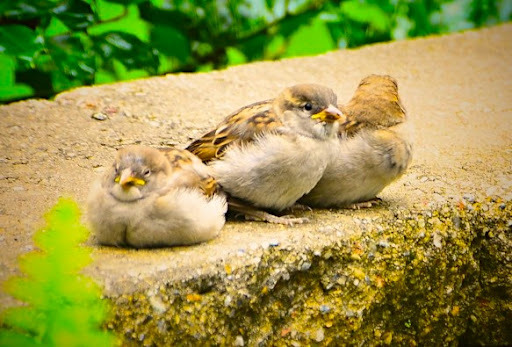 I must say that in your first picture, you have made the sparrows look colorful and pretty, even though they are cold blooded killers! And the babies are just so darn cute! I love your way of story telling, too! You must have so much patience to get these pictures!! I love all your birds! 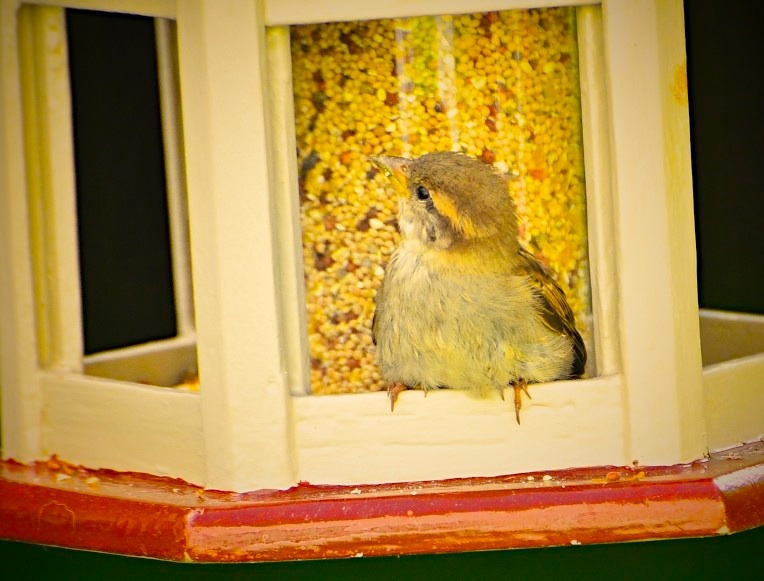 Such fun to visit your post at the end of my day and catch up with the guys and gals at the feeder! Delightful captures, fun story and lots of smiles and giggles -- and we can all use lots of those these days!! Thanks for the fun, Reena! I enjoy the conversations you are privy to! What a cute little bunch! Your pictures continue to amaze me! You do get the most amazing photos! You just make me laugh, you should put all these in a book. 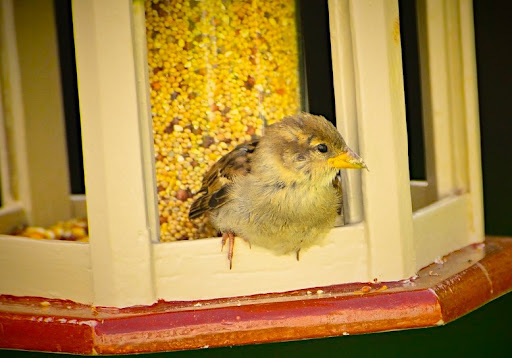 Loved the little sparrows, too cute. But I do the same thing, take shots of all the other birds and animals and never take any of the sparrows. I must remember to not hurt their feelings in the future. Argh! Those babies are so cute I almost fell off my chair. Such a great post! What lovely set of shots. 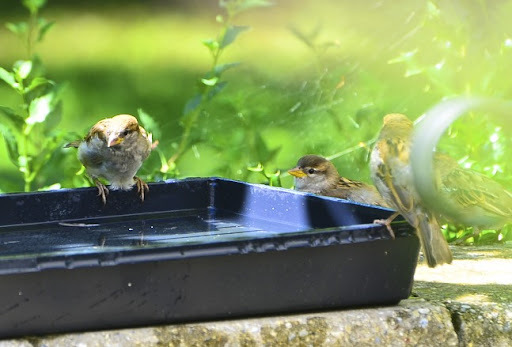 The babies as so cute and I love the shot where they are splashing the water. What a fun little family! 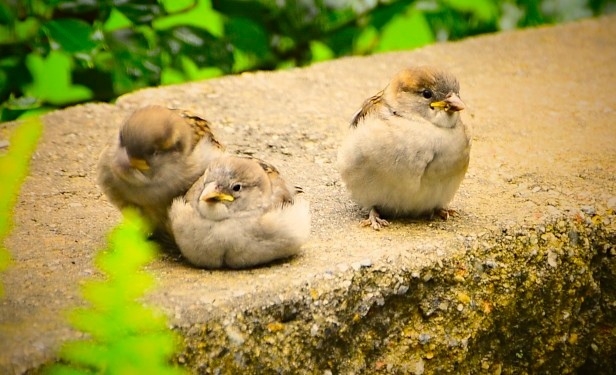 I love the three baby sparrows, very cute and fluffy. Hi Reena...This is great ...I loved it!! Awesome story & very cool shots, each & every one of them! I just love the photos of the cowbird interloper! 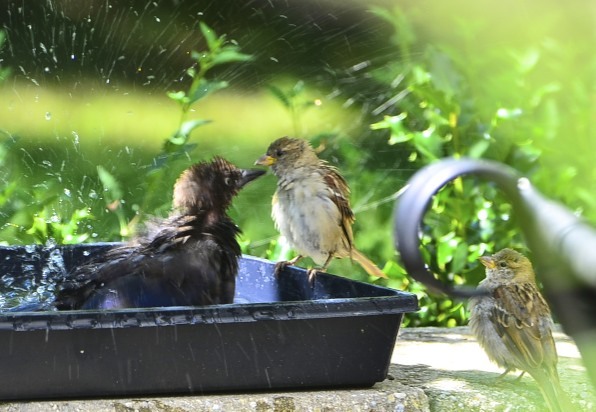 You actually made him look adorable:) The three little sparrows didn't need to bathe after getting showered by their brother! I love how they all have names!! These are FANTASTIC pictures! such cute, round, fluff balls! looks to me like they don't need to get in the water. they just need to be near calhoun when he is. A beautiful series of photos and your captions help me to see the interaction that went on between the birds. Wonderful photos! 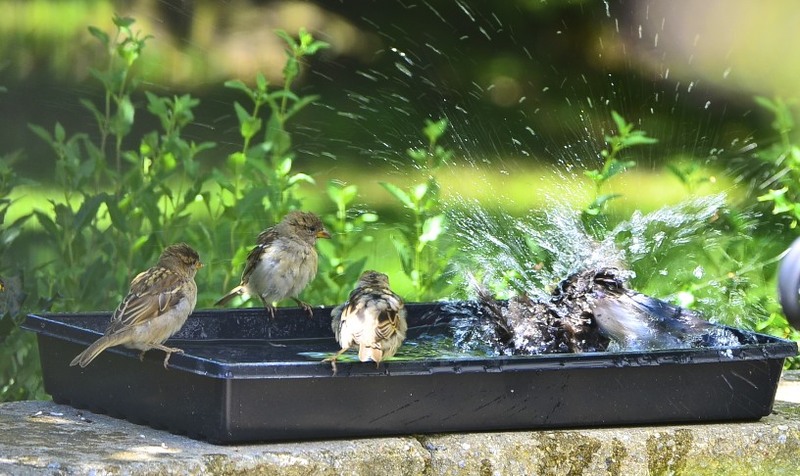 It made me so happy when I saw the birds in the bath together, soo sweet!! Reena, what a great series. 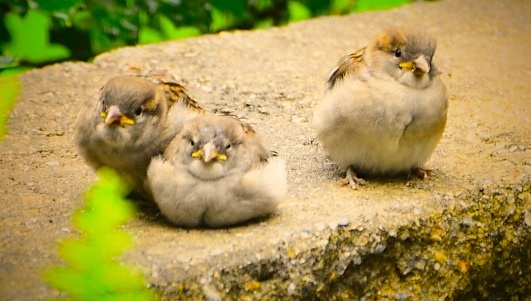 The juvenile sparrows are so cute and their big brother had me laughing. Wonderful post and photos. Hi there - Sparrows are an under-rated bird. I like them! 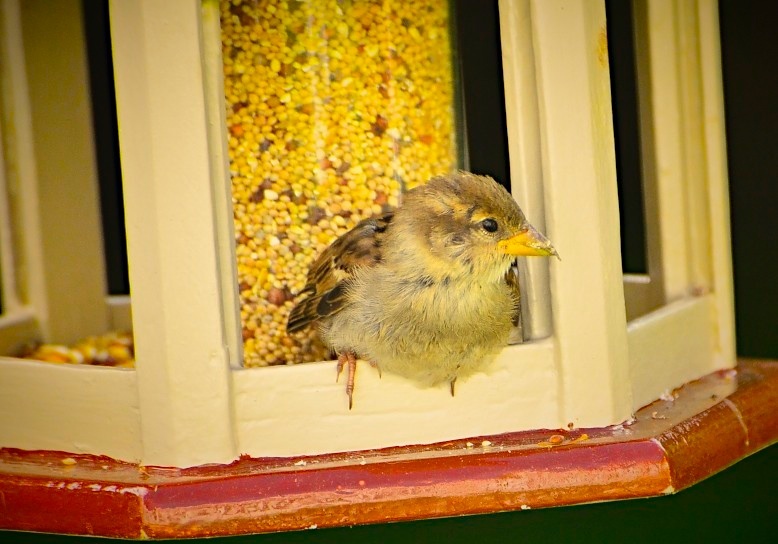 Great little birds to have around! I love your bird and animal stories. And the illustrations, of course! I'm so in love with these shots, you capture your visitors perfectly. I've just ordered myself a bird bath and can't wait for it to arrive. I hope the birds will use it. I am always amazed at your gorgeous photos. I don't know how you do it but I am a huge fan of our work. The birdies are beautiful - love seeing them at play. You have such a wonderful sense of humor. Love how you spun a story out of these sweet little sparrow birds. Terrific!!! I've never seen a sparrow with such amazing coloring as Mr Jack Sparrow! 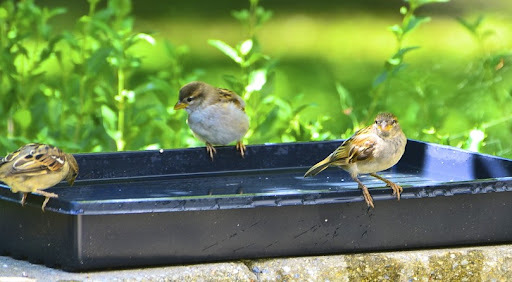 Al we get here are brown sparrows and equally brown house - wait I cant remember if they are finches or wrens .. OY! this had me smiling from the top to the bottom of the post..its like a family story ...you recorded it so well !! 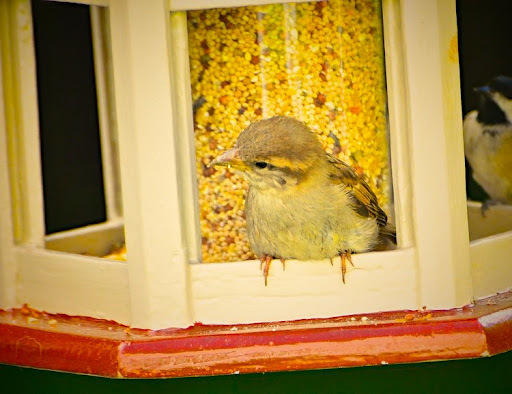 A great post on the sparrows Reena. The Cowbird really makes the story and I love the shot of the Cowbird sitting in the corner looking at his three "siblings." I didn't realize that Brown-headed Cowbirds parasitized House Sparrow nests. Very interesting. Since my comment is going to be 39th, I'm afraid I can't say nothing which hasn't been said so far! Your post is simply FABULOUS!!!!!!! I like sparrows. They're cheeky little buggers. And, I'm glad that Jack and his wife were able to raise their three, and the adopted Calhoun all safely. That's what comes of having a nice, safe place, with an endless supply of food. 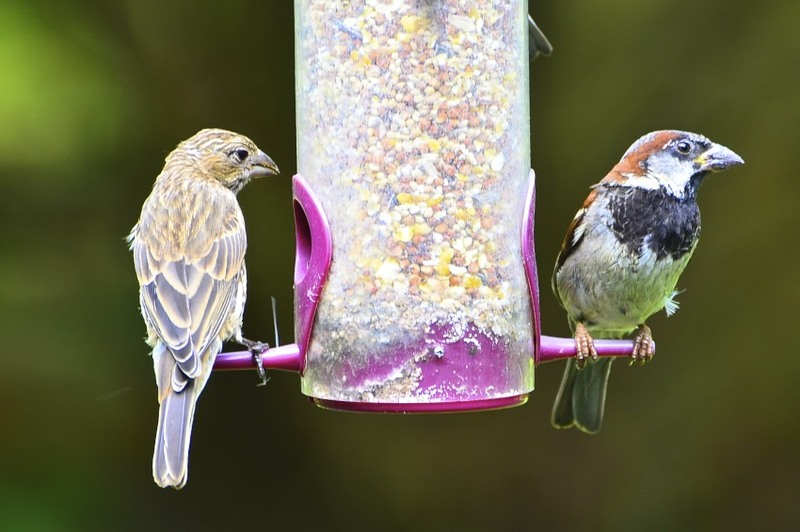 i am distracted by the "purple" feeder....awesome pictures and quite the creative story!! do these just "come" to you or do they take much thought?!?! ooooohhhhh now i get it, jack sparrow, johnny depp...or do i?? i may be just embarrassing myself!!! You have the most fun and exciting backyard ever! I enjoyed your photos of the little birds. You are amazing!! 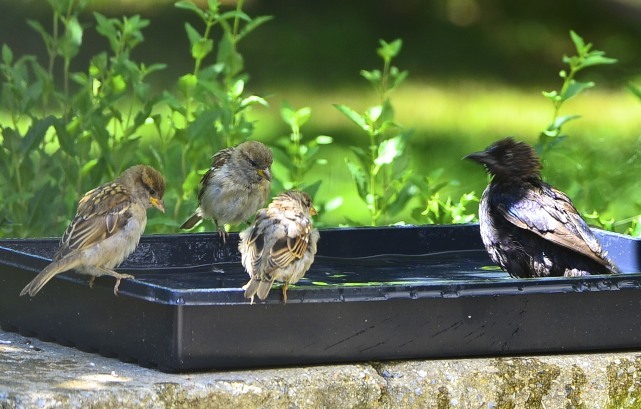 I'm sure all of your backyard birds have forgiven you after this equal opportunity post. those cowbirds are getting a bit too invasive if you ask me! once again, great captures and storyline! Superb photos of the Sparrows. You and your pics are PRICELESS. You have no idea how much joy your blog brings to my life. I'm speechless. But, I have to thank Daryl. For it was she who plugged me into you or you into me. I forget which. lol! Cheers renna!! What a lovely family Mr. Sparrow has. I never knew that about cowbirds but I just read it on someone's blog the other day. lovely images of your wonderful birds Reena. Oh, those little babies are soooo sweet! I have to agree that Joanne's little pose is just adorable. That pretty bird is a sparrow!!?? They are so sweet. And those rude cowbirds! The three J's are little butterballs! I love your pictures and story! Reena..I love bird and your photos are delightful ! Thanks for sharing with us...soon I will be posting about a very special bird visitor I had yesterday. I always have a camera by the back door to capture my little feathered friends. 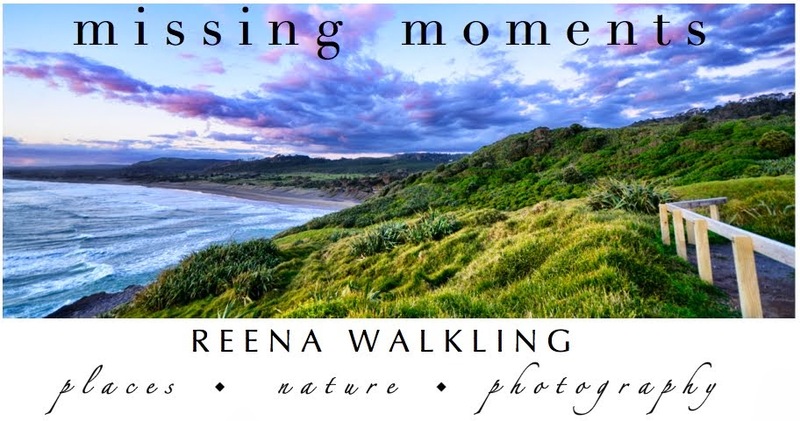 Terrific photo essay, Reena! That cowbird sounds like real gentleman: he didn't push his sibs out the nest - or is this storyteller's license? What a lovely and clean little family. 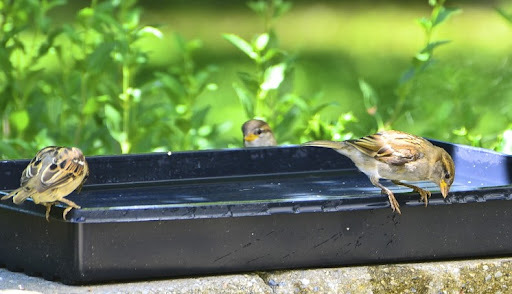 Their beaks seem to be longer than ordinary sparrows. Joanne's, of course, is the sweetest pose! She is the girl after all! Wonderful photo essay - esp of the big splash!